Hi my name is MOM oh wait my birth-name is Alexis. 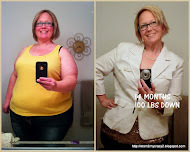 These days it's MOM and yes that's right it comes out at a level higher then a scream! I have 2 very active boys. 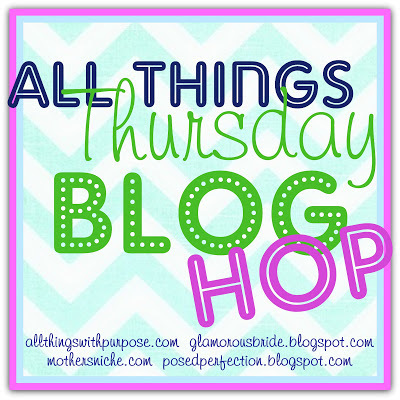 Hope you enjoy the wacky world I call life between working full time and taking care of the 3 boys (that includes my husband). Continuing on with the goody bags. Pinterest several food items, and most you know that I like to put fun creations instead of toys. 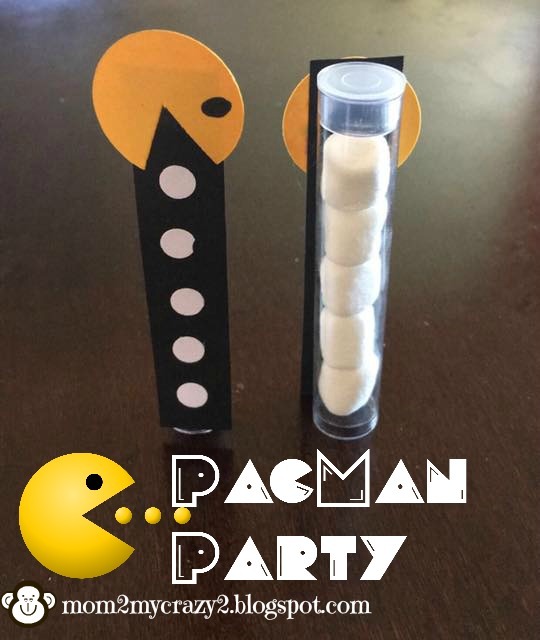 I found PacMan Dots Tube idea on Festa Teen and had to do for the party! I kept mine a little simpler to make the 20 I needed. 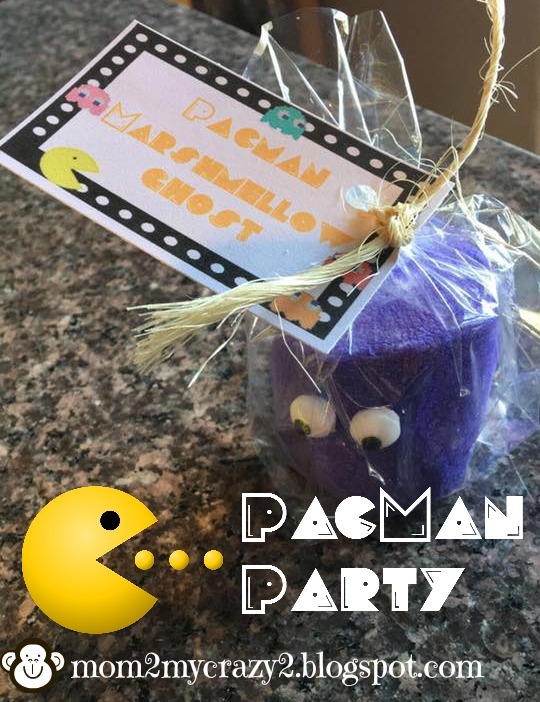 Another HUGE shout out to KandyKreations for these amazing PacMan tents. This is one of the BEST sites I've come across for party needs and she has a ton of FREE downloads which makes this mom very happy! 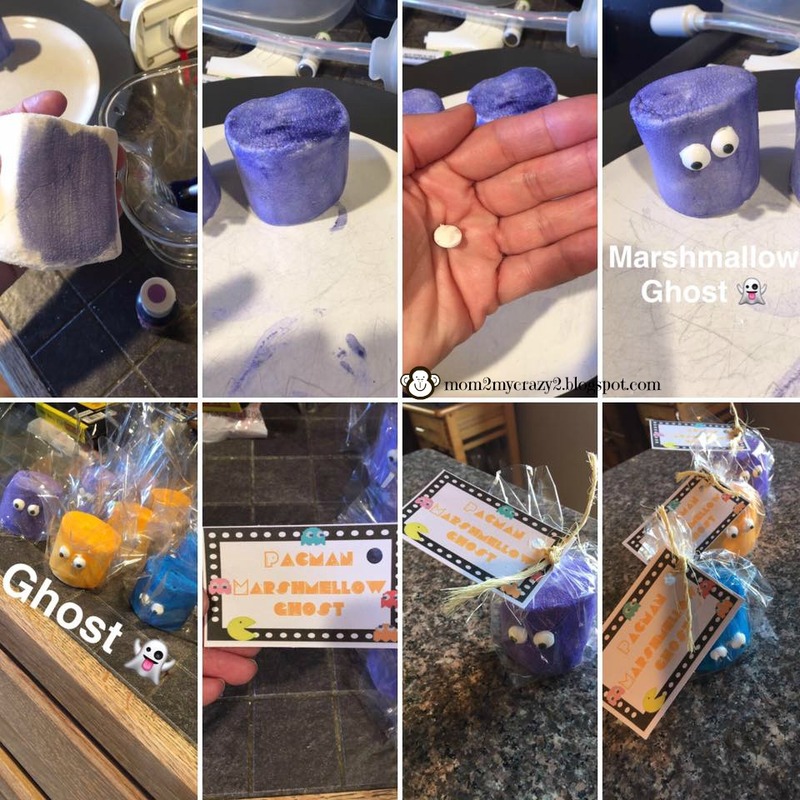 I took the Extra Large Marshmallows and took some food coloring with a little water to coat them I used yellow, purple and blue. After they dried I added the candy eyes. I found the royal icing is the best due to it acts like glue (a lot of ppl use it for gingerbread houses). After the eyes are harden onto the marshmallows I then put them in a clear plastic treat bag. I downloaded PacMan Font from DaFont, this is my go to place for font's. Now her tents were made to make a tent. I copied and put into a word doc to give me 8 per sheet. Since I was putting on the top of bags I didn't need to fold over or extra paper. PLUS I'm cheap and like to maximize my paper to the fullest . I attached the label to the clear bags using twine. Click HERE to see who I link with. 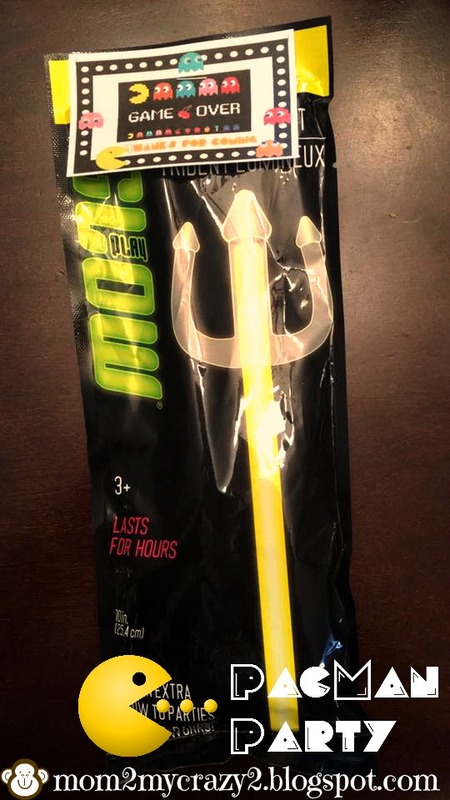 Continuing on with the goody bags. Pinterest several food items, and most you know that I like to put fun creations instead of toys. I found PacMan Dots Tube idea on Festa Teen and had to do for the party! I kept mine a little simpler to make the 20 I needed. I looked high and low for small white gum balls. I kept finding bags with multiple colors which then I would have to waste other colors. So I went with mini marshmallows that were cheaper. I took the tubes and placed mini marshmallows standing up to look like the dots in the tube. For the strips I took my paper cutter to cut the black strips that were the size of the tube. I took my hole punch to white card stock to make the dots the PacMan eat. I used my cricut to make small circles. I took my scissors to cut out the mouth, and took a sharpie to make the eye. I took a glue stick to place the white dots on the black strip. 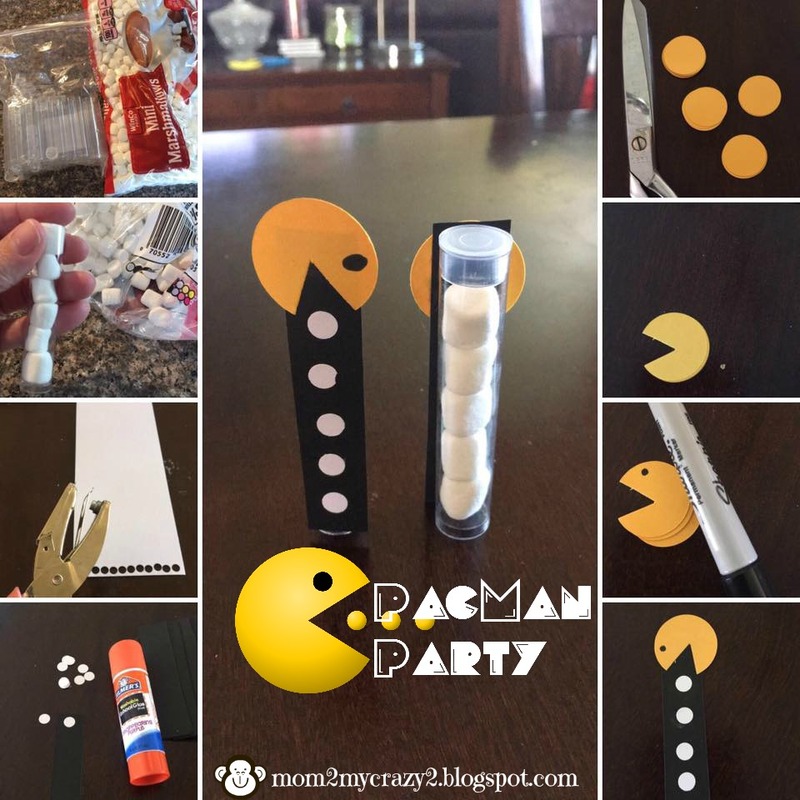 I then took the glue stick to glue on the PacMan. Once dry I took the glue gun to attach to the tube. Continuing on with the goody bags. Pinterest several food items, and most you know that I like to put fun creations instead of toys. 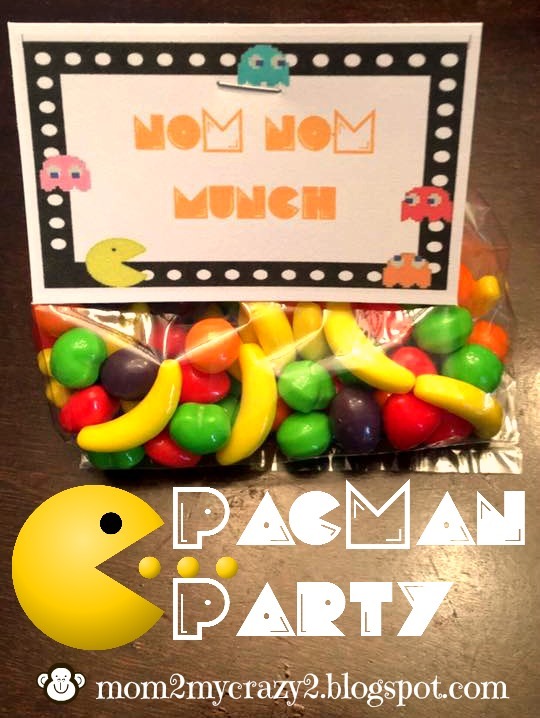 Another I HUGE shout out to KandyKreations for these amazing PacMan tents. 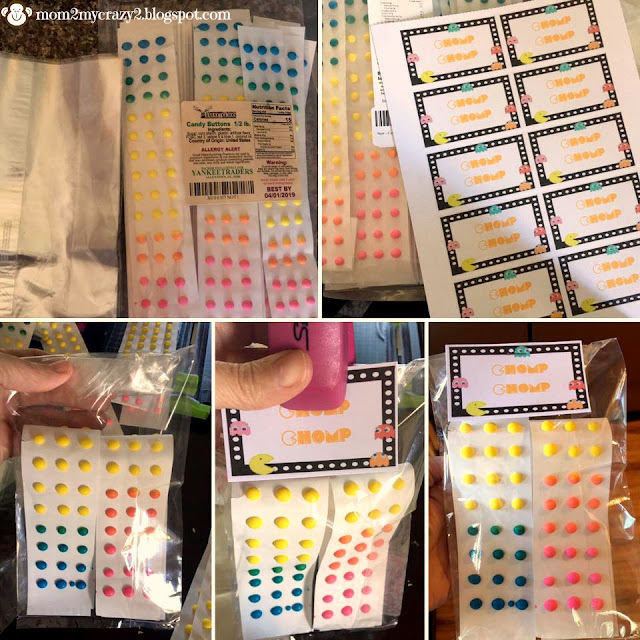 This is one of the BEST sites I've come across for party needs and she has a ton of FREE downloads which makes this mom very happy! I downloaded PacMan Font from DaFont, this is my go to place for font's. Now her tents were made to make a tent. I copied and put into a word doc to give me 8 per sheet. Since I was putting on the top of bags I didn't need to fold over or extra paper. PLUS I'm cheap and like to maximize my paper to the fullest. I found this image and copied into the word doc. Once I had my word Doc (copied her box then pasted into word to make 8). 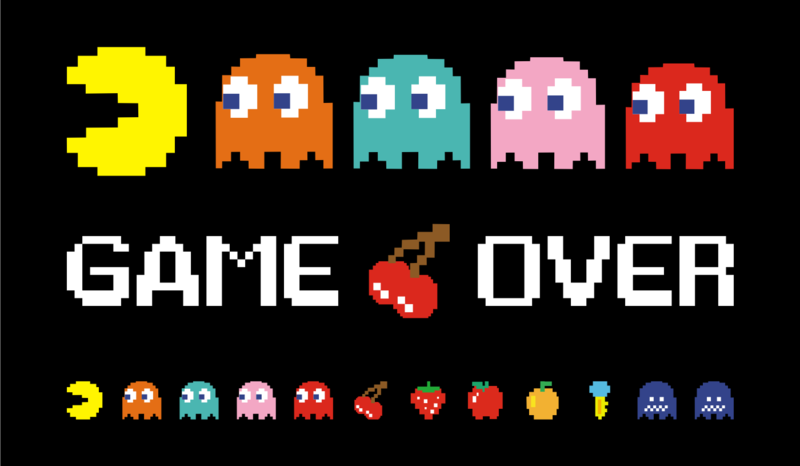 I then added text boxes to add the clip art I found (Game Over) and the words Thank for Coming below. I took my paper cutter to cut each label out and attached with my stapler. Once I had my word Doc (copied her box then pasted into word to make 8). I then added text boxes to add the words Chomp Chomp. Once set up, I printed on heavy card stock. 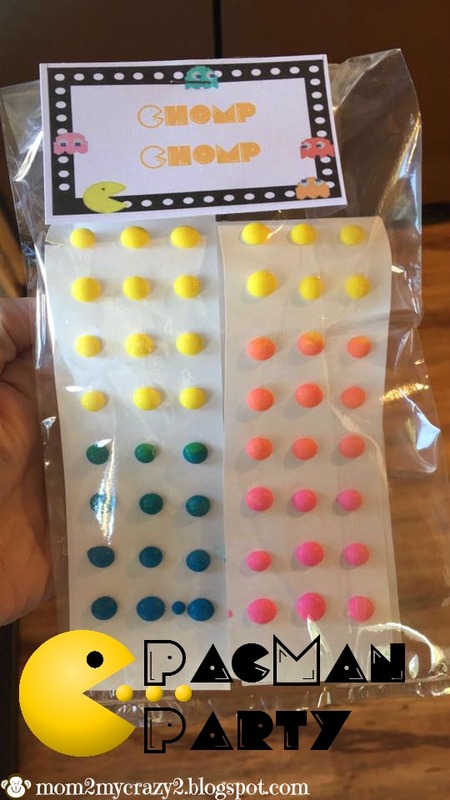 I filled each large plastic clear bag with a a few strips of the button candy. I took my paper cutter to cut the labels down and attached with a staple. Make sure you fold up the back of the bag so the staple holds the bag shut! Continuing on with the goody bags. Pinterest several food items, and most you know that I like to put fun creations instead of toys. Another HUGE shout out to KandyKreations for these amazing Power Pill Toppers. 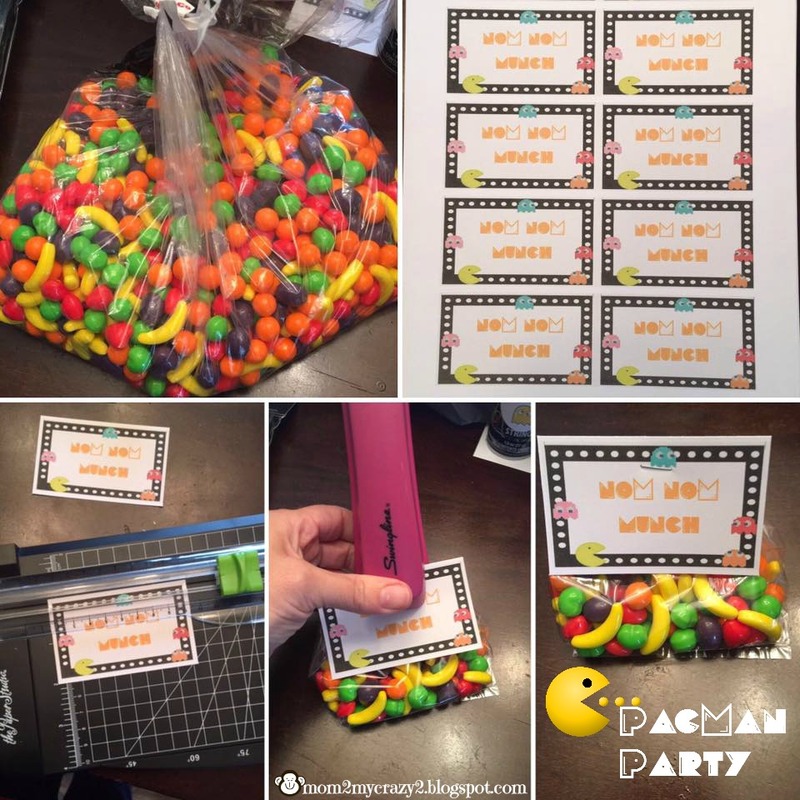 This is one of the BEST sites I've come across for party needs and she has a ton of FREE downloads which makes this mom very happy! I downloaded PacMan Font from DaFont, this is my go to place for font's. I printed out the sheet she had provided. 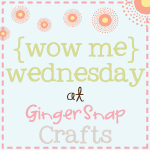 I took my paper cutter to cut them into little cards. I filled each mini plastic clear bag with a handful or more of candy. I then attached with a staple. Make sure you fold up the back of the bag so the staple holds the bag shut! 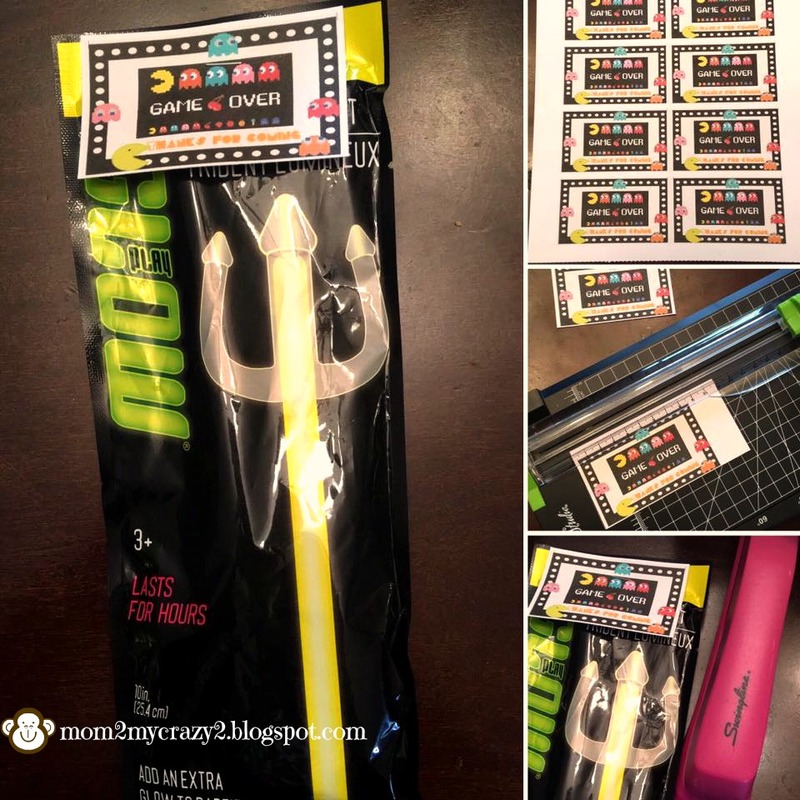 Previously I showed you the outside of the goody bags, today is more on what is inside. 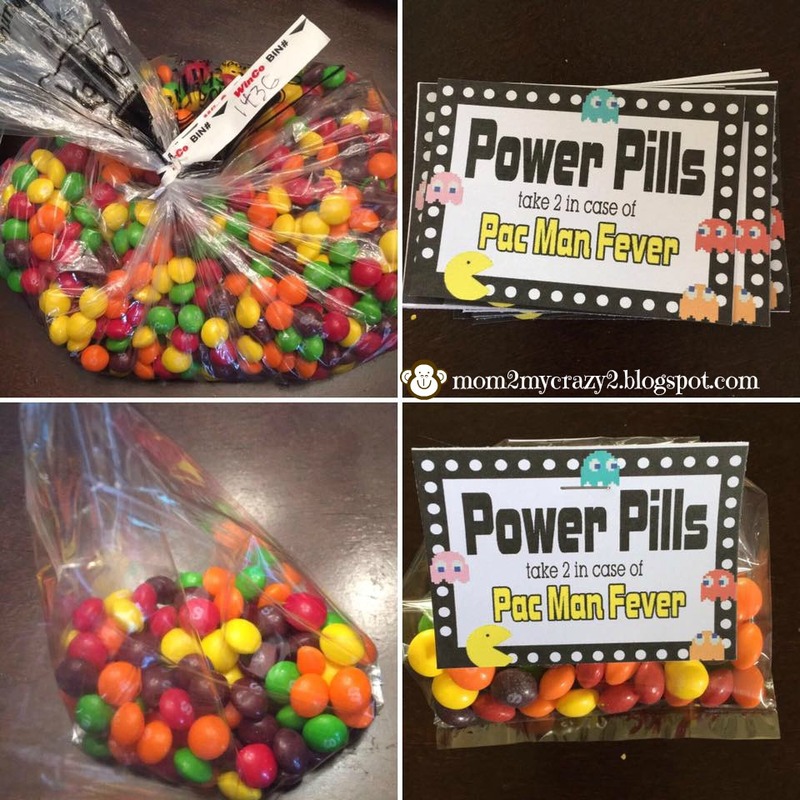 I saw on Pinterest several food items, and instead of toys that get thrown out I rather put in goody bags. 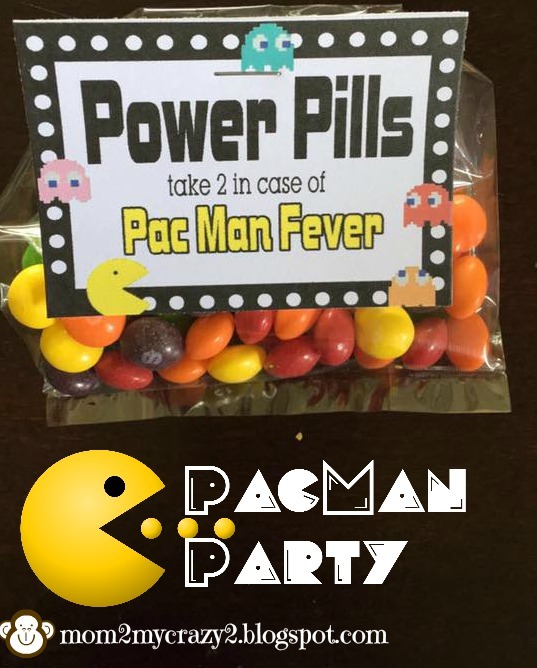 I HUGE shout out to KandyKreations for these amazing PacMan tents. 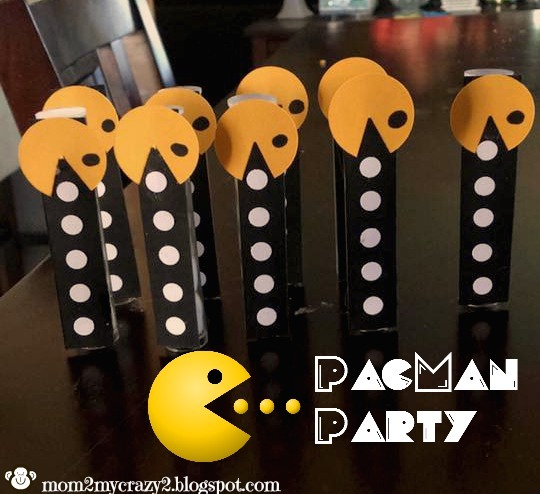 This is one of the BEST sites I've come across for party needs and she has a ton of FREE downloads which makes this mom very happy! Once I had my word Doc (copied her box then pasted into word to make 8). I then added text boxes to add the words Nom Nom Munch. Once set up, I printed on heavy card stock. I filled each mini plastic clear bag with a handful or more of candy. I took my paper cutter to cut the labels down and attached with a staple. Make sure you fold up the back of the bag so the staple holds the bag shut! Thank You to My Wonderful Sponsors!!! Have you ever run into the person that you give a compliment to and they tell you where they got it and what a deal they got? Well yes that would be me, I'm a natural born gabber who loves deals and LOVES to share them with everyone (even if they may not want to listen ... LOL).